Supply-chain issues sent shares of Coty Inc. plummeting Wednesday morning after the beauty-products maker missed first-quarter revenue estimates but beat on earnings. 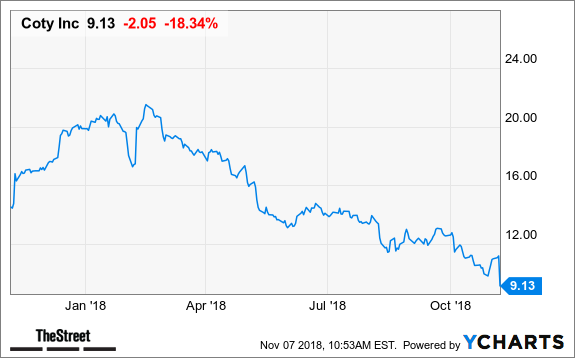 Supply-chain issues sent shares of Coty Inc. (COTY) plummeting 20% Wednesday morning after the beauty-products maker missed first-quarter revenue estimates. Coty Inc., which has licensing deals with brands including Gucci, Tiffany and Miu Miu, posted revenue of $2.03 billion, down 9.2% from a year ago and missing analysts' expectations of $2.17 billion. The company posted earnings of 11 cents a share, up from 10 cents per share a year ago, and beating Wall Street estimates of 7 cents a share. "We are very disappointed with the supply chain disruptions that we have experienced over the last quarter and the resulting poor Q1 financial performance," Camillo Pane, Coty CEO said in a statement. "While we had anticipated some level of disruption in the first quarter from warehousing and planning consolidation, the increased scope of the disruptions resulted in much weaker results than previously expected." The company said Hurricane Florence, which struck in the second half of September, "significantly impacted" the manufacturing plant and distribution center in North Carolina, which primarily affected the luxury division. Looking ahead, Coty Inc. said it expects underlying year-over-year net revenue trends to improve in the second quarter in its three divisions despite expected supply-chain headwinds.